These vehicles can run side hill, remaining horizontal. Caterpillar Ecolog 550 at Forexpo, Bordeaux, France. Pict Francis Pierre, 2002. Ecolog 550C Harvester at International Exposition at Lucerne in 2009. James Bird, Tulsa, conceived this self-leveling vehicle seen in the review 'Popular Science' of January 1971. US003642085-001 self leveling vehicle of James Bird, Tulsa, Oklahoma, 1971. 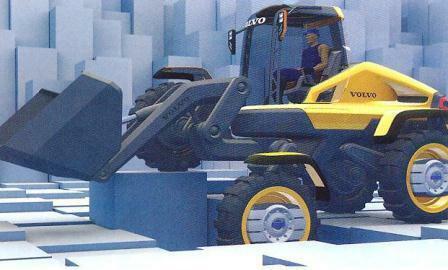 Volvo wheel loader Gryphin is a design study of Volvo Construction Equipment in 2008 by Hans Philip Zachau. It must be noted that suspension enables to keep the vehicle level on slopes. Pict from review 'Classic Plant & Machinery', Aug 2008. Safe-track Mulcher of Green Mech. Pict J M M at Forexpo, Mimizan, 2004 06. Safe-Trak of Green Mech. Pict J M M at Euroforest, St Bonnet de Joux, 2006 06. Neuson Harvester for slopes, from Germany. Pict J M M at Forexpo, Bordeaux, 2008 06. Kaiser S2 4x4 Cross. Pict J M M at Forexpo, Bordeaux, 2008 06. Kaiser Walking Excavator. Pict J M M at Euroforest, St Bonnet de Joux, 2010 06. X-Musen at Fordon museum, Sweden. in 2002. This museum is now shut and a new one is open since 2012 at Strängnäs. Pict Francis Pierre around 2000. X-Musen (X-Mouse), experimental vehicle of the 60's. Each wheel mounted on arms can rotate 360° and is fully running condition. It looks like Wagner vehicle (see chapter : the Go Devil of Wagner) and is displayed from 2012 at Museum of Stragnäs : Arsenalen, in Sweden. X-Musen was a very innovative articulated vehicle able to run level side slope and to climb onto obstacles thanks to its arms. This vehicle is now at Arsenalen Museum Strängnäs, Sweden. Picture J M Maclou at Strängnäs in April 2010. They can see the articulation of X-Musen on this picture of J M M in April 2010 at Strängnäs, Sweden. Galaxylift GS 15-08 nacelle, Pict J M M at Intermat, Villepinte, 2006. This machine has four legs which can be independently laid on slope for the stability of a nacelle, but it's not a moving vehicle although there is a tracked tractor. Cat R4 and Holt 'hillside' combine in mid-30s. The combine is not off-road but could move side slopes. Pict from book of R. Pripps, 'Farm Crawlers, MBI, 1994. Gremo Besten RH 106 harvester is a self-leveling vehicle fitted with hydraulic suspension. Tractor for slopes. Pict from book of Alain Dupouy, 'Tracteurs et Engins Chenillés Soviétiques, Tome 1', 1986. Alain Dupouy was the best French specialist of Russian vehicles. Automatic self-levelling tracked vehicle made by the author with its Meccano/Erector in 2006, Pict J M Maclou, near Paris. Rottne H8 has a narrow and compact chassis with a swing arm system. Lucane BB TECH for forestry, 8x8. See Chap 'Self-leveling vehicles'. Pict J M M at Euroforest, St Bonnet de Joux, 2010 06. Teupen Nacelle. These machines are not true leveling vehicles but could be. Pict J M M at Intermat, Villepinte, 2012 04. Maeda Mini cranes MC405 and MC285. Pict J M M at Intermat, Villepinte, 2012 04. Imer nacelle. Pict J M M at Intermat, Villepinte, 2012 04. Hier nun mal etwas besonderes.